The journey around Japan's garden culture begins with "Hokkaido Garden Path"
Why do not you go on a trip on the beautiful garden where Hokkaido's rich land grew? 2013/9/21 Start selling "pumpkin tart" using fresh pumpkin at Furano Marche in Furano from 10 month 1 day! 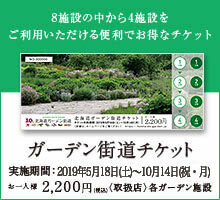 What is the Hokkaido Garden Path? It is created with the award for excellent prize winning. Copyright © 2019 Hokkaido Garden All rights reserved.